Well made, pure white, and a great price! 510 Design's Denice 4-piece Comforter Set offers a graceful and charming update to your bedroom. The white comforter and shams feature a ruched design with pleated details that create a beautiful textural look. An embroidered decorative pillow provides the perfect finishing touch to the top of the bed. Made from ultra-soft microfiber, this casual comforter set is machine washable and pairs easily with any bedroom decor. 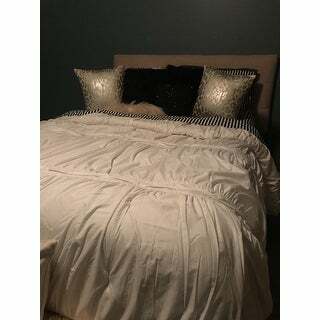 Paired this comforter with black and white pinstriped sheets and it is sharp. Got those on Overstock as well. My daughter loves it. 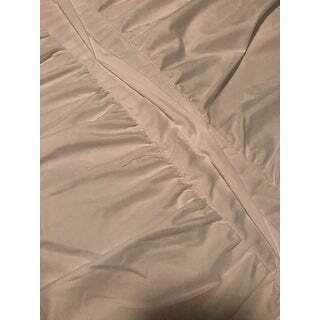 The comforter has a small pin-tuck feature on it as well. Nice little touch. Fluffy and Comfy! Just what we wanted.